Thomas A. Edison Signed Photograph. Large signed photograph of Thomas Edison. Double matted and framed. The entire piece measures 15.5. inches by 18.5 inches. Thomas Alva Edison was an American inventor who developed many devices including the motion picture camera, the phonograph and the electric light bulb. Dubbed "The Wizard of Menlo Park", he was one of the first inventors to apply the principles of mass production and large-scale teamwork to the process of invention, and because of that, he is often credited with the creation of the first industrial research laboratory. 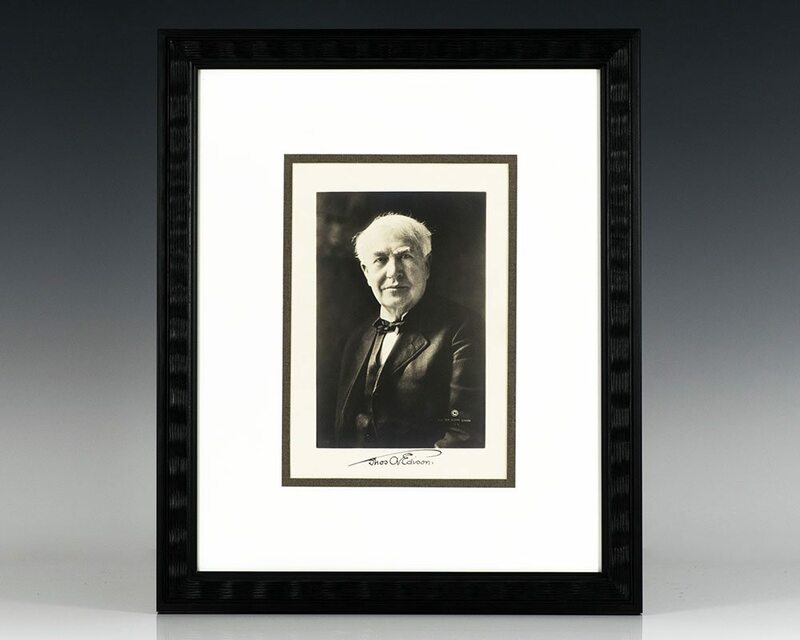 Large photograph of Thomas Edison, signed by him. Matted and framed. The entire piece measures 16 inches by 20 inches. 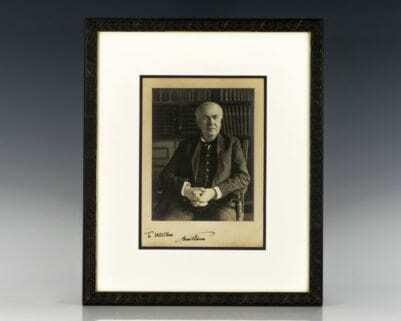 Large signed photograph of Thomas Edison showing him in his library with hands clasped. Inscribed by Thomas Edison. Double matted and framed. The entire piece measures 15.5. inches by 18.5 inches. Edison, Thomas Alva & Terry Ramsaye. A Million and One Nights: A History of the Motion Picture. New York: Simon and Schuster, 1927. Signed Limited edition, one of 327 copies. Quarto, original half pigskin over boards, top edge gilt, 2 volumes. Signed by Thomas Edison on the limitation page and additionally signed by Ramsaye. Illustrated with numerous photographic plates. Some staining to lower section of spines, some rubbing and edgewear to boards, a very good set. Copies of the limited edition were also bound in cloth, this is the more uncommon leather bound edition.